The two schools at the top of the list are both big state research universities, the University of California, Los Angeles and the University of California, Berkeley. They were No. 2 and 1 last year, but this year they’ve switched places. 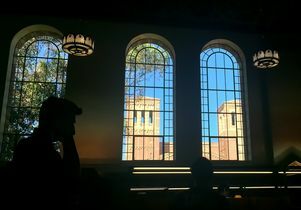 UCLA edged ahead of Berkeley because its yearly net price, $14,200, is lower than Berkeley’s $17,200, and it has a greater share of students receiving federal Pell Grants, 35% versus 31% at Berkeley. The study, performed by researchers from the University of California–Los Angeles Fielding School of Public Health and the Columbia University Mailman School of Public Health, examines data from the General Social Survey, an assessment conducted every two years to gauge American public opinion toward a range of social issues, including immigration. The researchers then compare this data with mortality rates in the chosen communities to examine whether anti-immigrant sentiments affect mortality rates among members of those communities. The $367-billion figure Newsom used comes from a 2016 study done in part by Gerald Kominski, a professor of health policy at UCLA. Kominski agrees that, in theory, additional revenue might not be necessary if all of that money spent on health care in California can be funneled to a single state health care agency. Dr. Karol Watson, director of the UCLA Barbra Streisand Women’s Heart Health Program at the David Geffen School of Medicine, says that heart disease seldom results solely from a single source, even chemotherapy, but rather tends to be a more cumulative process. Watson was a co-author on the AHA statement and says radiation therapy — especially in patients with breast cancer in the left breast, which sits right over the heart — can also cause damage to the heart. “This is really a whole new view of mitochondria and what they can do,” said lead author Dr. Orian Shirihai, a professor of medicine in endocrinology and pharmacology at the David Geffen School of Medicine at UCLA. The finding, published in Cell Metabolism, may one day lead to new treatments for obesity, fatty liver and other metabolic diseases, he added. The study, which was an international collaboration with King’s College London, MRC Harwell, the University of California in Los Angeles, University of Pennsylvania and others, also showed that the effects of these gene variations were specific to females.